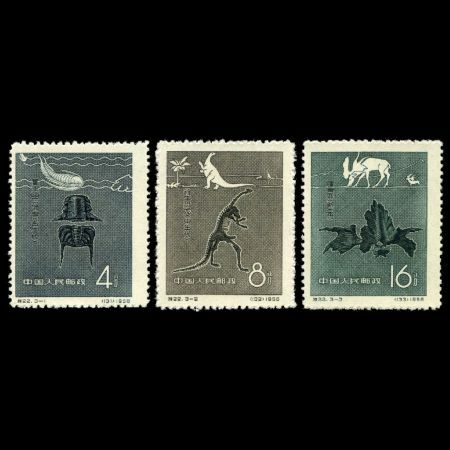 The set is the first stamp set depicted dinosaur, issued in China, on 15.4.1958. 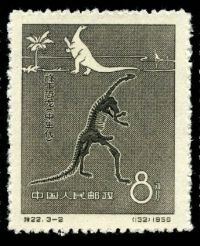 The set of 3 stamps shows Lufengosaurus, a trilobite and the giant deer of China. 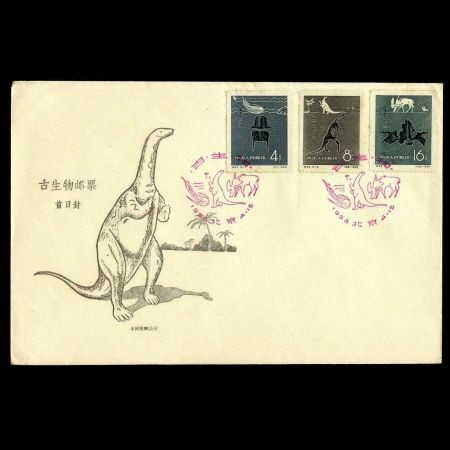 Lufengosaurus, meaning Lufeng lizard, is a genus of sauropod dinosaur from the Early and Middle Jurassic Period of what is now southwestern China. 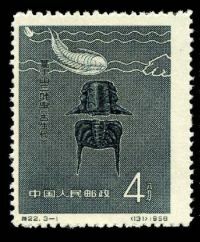 It was named by C. C. Young in 1941. 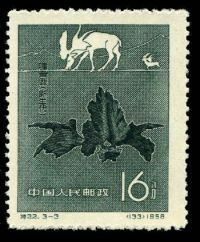 The type species, Lufengosaurus huenei, was discovered in the Lower Lufeng Formation of the Yunnan Province in China. 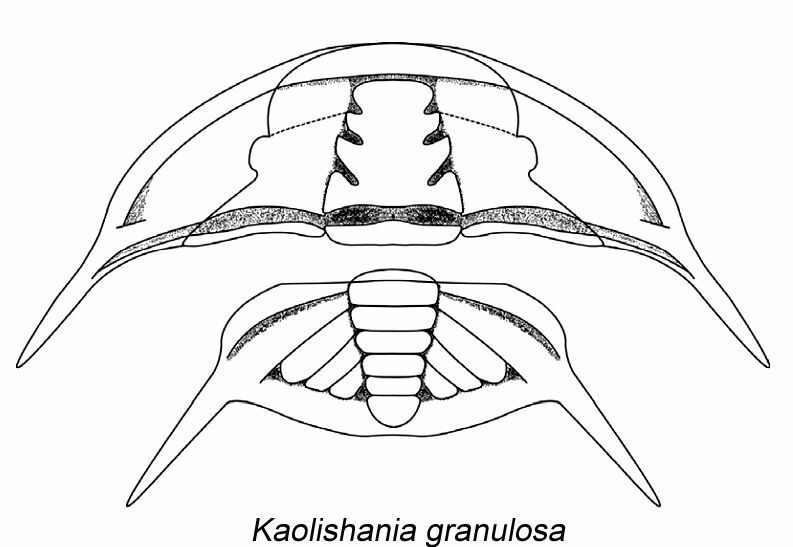 Young described and named a second species a few years later. This is one of the few prosauropod dinosaurs to survive from the Early Jurassic eras. 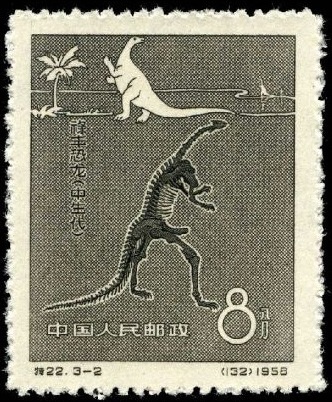 Lufengosaurus was about 20 feet long. 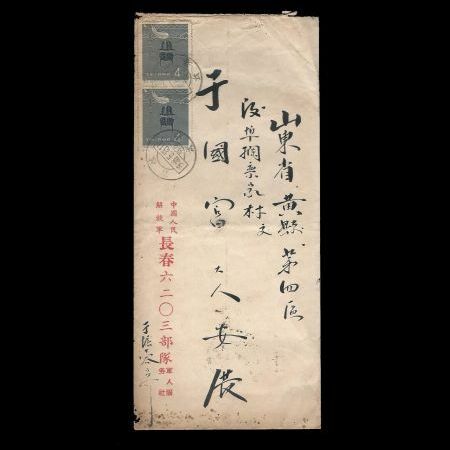 It had long hind limbs and shorter forelimbs. It was most likely bipedal at least part of the time, especially when foraging for food. It was a herbivore, although it had very sharp claws and teeth. There are some claims that this may have been a possible omnivore based on its claws on teeth. However, the sharp teeth seen in Lufengosaurus are similar to the teeth seen in herbivorous lizards of today, such as the iguana. The claws of the dinosaur may have been used solely for defense or possibly for raking foliage from the trees. 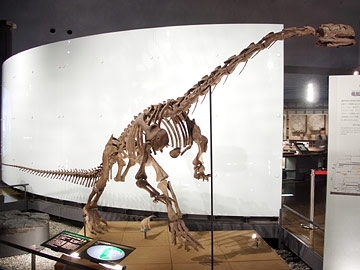 Lufengosaurus became the first complete dinosaur skeleton to be mounted in China and displayed in Beijing. 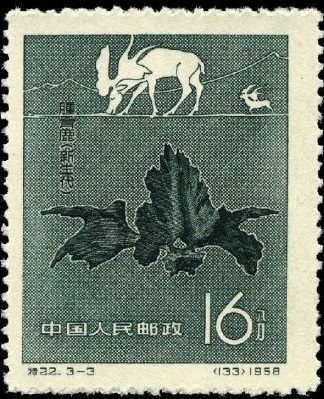 A commemorative postage stamp was issued in 1958 to celebrate the event. 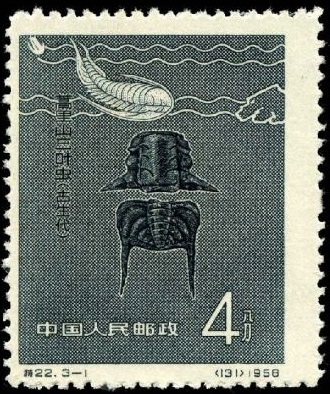 Another two stamps depicted Kaolishania pustulosa, trilobite from Paleozoic, found in Haoli Mountain of China and Chinesis great dear - Sinomegaceros pachosteus who lived in Cenazoic epoch. Giant deer with palmate brow tines were placed either in a single genus, or those from west Eurasia were placed in Megaloceros and those from the east in Sinomegaceros, which implies local evolution. 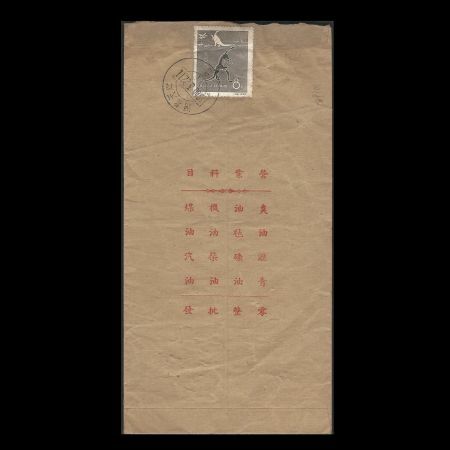 In order to see whether dispersals between the two areas may have occurred. 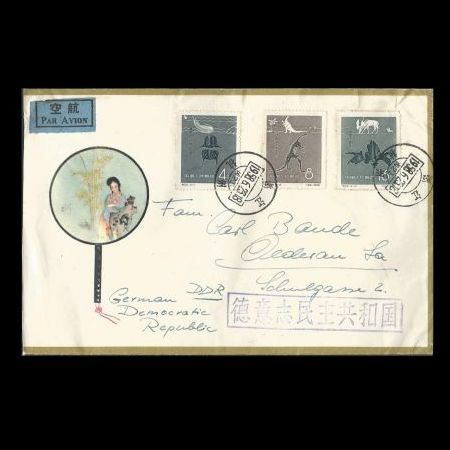 Lida XING from Biological Sciences, University of Alberta, Canada, for his help to find some additional information about these stamps.